Bannerman's Castle is located on Pollopel Island (a/k/a Bannerman's Island) in the Hudson River, a few miles south of the Beacon-Newburgh Bridge. The castle was built as a weapons arsenal by Francis Bannerman VI, a businessman who dealt in military surplus from the Spanish-American war. I used to visit the island during the summer with friends for many years exploring the interior of the buildings when it was abandoned and off limits to the public. 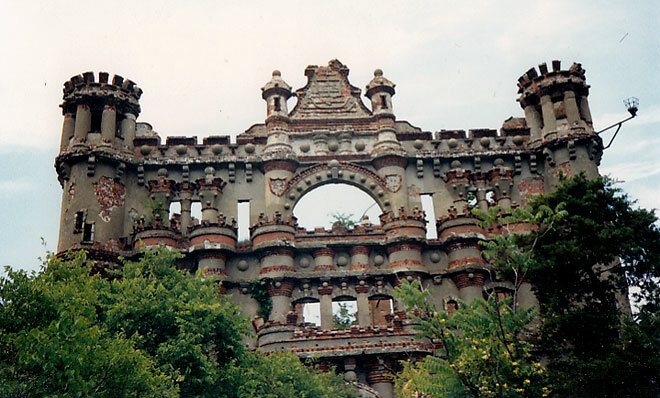 In December 2009, a portions of the Bannerman's Castle main tower collapsed. However, you can still visit Bannerman's Island today by taking a guided tour. Lastly, here are some links to more information on the castle and the island. Bannerman's Castle (Bannerman's Island Arsenal) on Pollepel Island in the Hudson River.